After years confined to squeezy bottles and jars at the back of the cupboard, honey is finally getting the attention it deserves. It has always been revered for its health properties, even credited with promoting weight loss in this year’s “honey diet”, and there has been a spate of DIY beekeeping in a bid to combat dwindling numbers. But it is getting noticed for other reasons these days. New Yorkers are going crazy for an infused chilli version, and UK chefs and bartenders have rediscovered the joy of mead, that ancient – and very alcoholic – tipple. 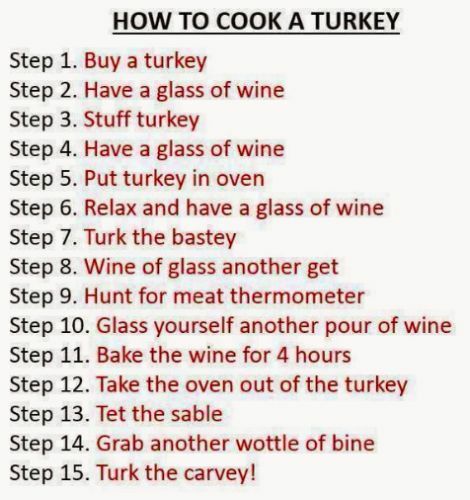 But by far the most intriguing example is Turkey’s “mad honey”. Here are the honeys that pack a punch. From the sleepy Turkish mountains we jump to the lively streets of Brooklyn, where “hot honey”, a chilli-infused condiment, is making waves (and has even been tipped as the next sriracha). 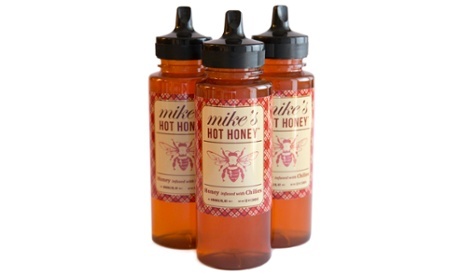 Leading the way is Mike’s Hot Honey, based on a sauce that owner Mike Kurtz discovered in a rural Brazilian pizzeria. Combining a secret type of South American chilli (which sits somewhere between jalapeños and habaneros on the spicy scale) with honey and a dash of vinegar, this is not for the faint-hearted. According to Kurtz, the reddish liquid initially tastes sweet, before making way for heat – and a slight smokiness – after a couple of seconds. The home base for Mike’s Hot Honey is Paulie Gee’s pizzeria in Greenpoint, which not only sells the sauce over the counter, but also showcases its versatility by drizzling it over pizza and ice-cream (apparently, it’s even better with ricotta on toast). Unfortunately, neither Mike’s nor any of its US competitors, such as MixedMade’s Bees Knees Spicy Honey or Negley & Son Spicy Honey, have yet made their way to Britain, although you can buy Mike’s online if you’re prepared to wait and don’t mind splashing out (it’s $10 for the honey and $24 for shipping). For the moment, it seems that Britain has only one hot(ish) honey product, courtesy of Hilltop Honey. However, the company likens its honey infused with chilli to sweet chilli sauce, which suggests that it doesn’t quite pack the heat of its US counterparts. When it is time to put out the fire in your mouth, honey has the answer once again. Mead, AKA honey in alcohol form and the oldest alcoholic drink in the world (as well as being the source of the word “honeymoon”, from the pagan tradition of drinking mead for the first month of marriage), is enjoying a revival after years of being dismissed as beer’s daggy medieval cousin. This restarted in the US, with more than 200 meaderies popping up in the past decade. 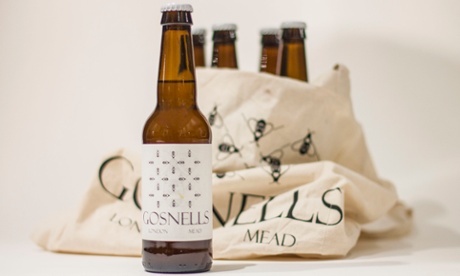 And although Britain’s mead market has been slower to pick up, the arrival of Peckham-based Gosnells London Mead on the scene last year, joining stalwarts such as the Cornish Mead Co, seems significant. The drink is made via a similar fermentation process to cider, with apple juice swapped for honey. By substantially reducing the alcohol content from the traditional 16% to 5.5%, Gosnells offers a lighter and more accessible version, which found an immediate fanbase at Maltby Street market in London, The Table in Cambridge and Timberyard in Edinburgh, where it is served straight or in cocktails with gooseberry, sorrel stem, quail egg and vodka. 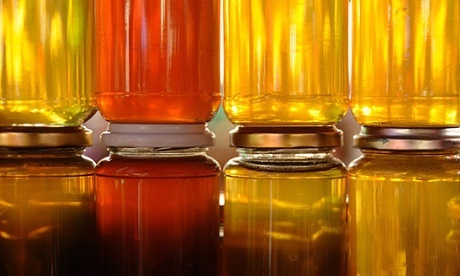 Mead has also been championed by chefs such as Simon Rogan and René Redzepi. Signs are promising. 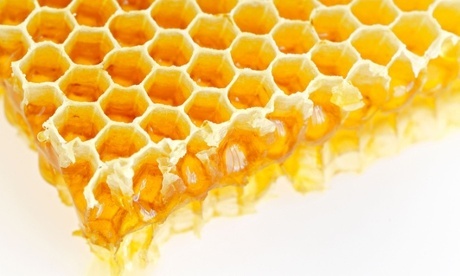 Between sending you crazy, spicing up your life and cooling everything down again, it seems that honey – in all its forms – has plenty of buzz about it. There are few vegetables that I find distasteful, this great purple monstrosity is one of them. They are related to tomatoes and potatoes (Solanum family), both of which I love. 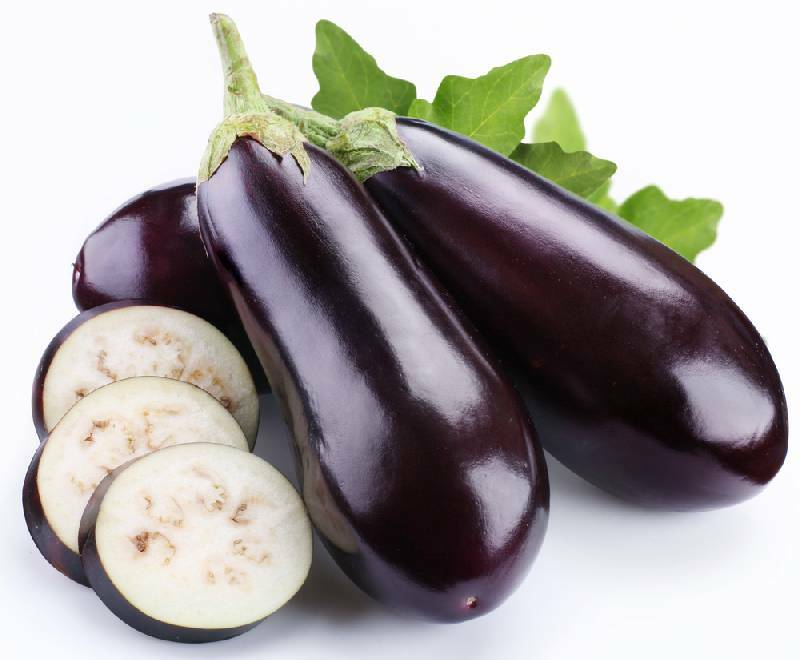 Technically, the aubergine is not a vegetable, but rather a berry. I know all this, but why does it have to be so obnoxious? Then I found this, it almost seems appealing; appealing enough to try. 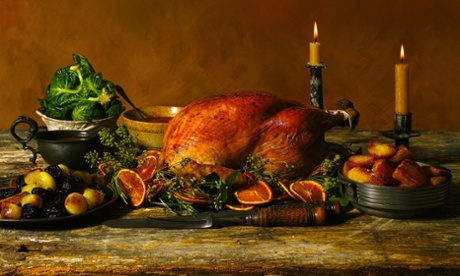 Everyone has their gastronomic tics – those dishes, or ingredients, or techniques, that suddenly make everything else on the menu look like ugly sisters. The word “smoky” generally does it for me, although I’m a sucker for a nice juicy aubergine as well, so if baba ganoush is available, you can keep your boring old hummus – my pitta is only going in one direction. Like the ubiquitous hummus, this is a dish of indeterminate origins: Levantine is probably as specific as you can fairly get, because it pops up, under a variety of names, from Turkey to Egypt as a dip, a salad, or a vegetable side. It might be loose and smooth enough to scoop with bread, or so chunky you need a fork to tackle it – but never less, as Anissa Helou observes, than “exceptionally good”. And, with aubergine season drawing to a close, this is the time to tackle it. Smokiness is what defines this dish, setting it apart from your common or garden baked aubergine. Ideally, I’ve found, this is best achieved over a hot barbecue, but unless the weather’s picked up dramatically in the last few days, you’ll be relieved to know other options are available. Helou, writing in Modern Mezze, suggests pricking and grilling them, an option also given by Claudia Roden and Rebecca Seal in her book Istanbul. The latter two also, however, give the option of charring them directly over a gas flame, as in Yotam Ottolenghi’s recipe. I find this, though much fiddlier and messier, gives a far better result: the grilled aubergines seem shrunken and almost desiccated, while the others are fairly bursting from their burnt skins. David Lebovitz hedges his bets, charring them over a flame and then baking them in the oven until soft, but I’m not sure I see the point, as long as you bear in mind the advice given to Seal by Gençay Üçok of Istanbul’s Meze by Lemon Tree restaurant: “If you think the aubergines are done, they’re not done.” They need to be not just charred, but collapsing in on themselves, and decidedly soft all the way through. Once you’ve made a complete mess of your hob charring the skins, they need to come off – Ucok seems to think that some people rinse the aubergines in water to get rid of them, which he strenuously warns against, but none of the recipes I find dare suggest such heresy. Scooping the flesh out of the papery skins is easy enough: Seal says that some Turkish cooks also reject any flesh that is even slightly discoloured, but, like her, I enjoy the “intense smoky flavour” these bits supply, so I won’t be wasting any. Even after all that cooking, aubergines are watery little things, and if you’re not to stray into blandly soggy territory, you need to squeeze as much liquid out of them as possible. This is generally done with patience and gravity, but Seal and Roden both suggest squeezing the flesh out in a sieve, rather than letting it drain for Ottolenghi’s “hour at least, preferably longer”, and I must say that, if done diligently, the results seem just as good. Ottolenghi may be averse to squeezing because he leaves his aubergine in “long thin strips” rather than mashing it gently, as Seal, Helou and Roden recommend. This makes it more of a salad than the dip I’m after – a bit of texture is welcome (Lebovitz whizzes his up in a food processor to give a smooth puree that reminds me more of hummus than anything else), but I also like baba ganoush to have a bit of creaminess about it. 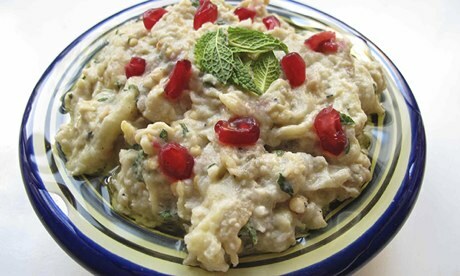 Happily, as it’s another ingredient I carry a candle for, garlic is number two in the basic trinity of baba ganoush. Quantities vary, with Helou going for a modest single clove to six aubergines, while Roden uses a clove per aubergine. I like a hefty whack of the stuff, so I’m copying her, but if you’re shy, by all means add it to taste. 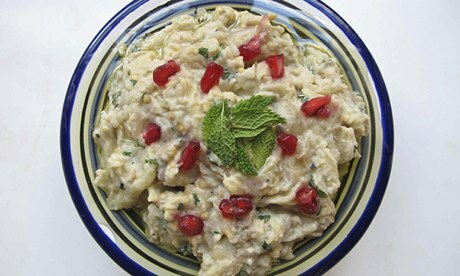 The final element of every baba ganoush, mutabal or patlican ezmesi is lemon juice – and again, quantities vary. Helou is once more parsimonious, as is Ottolenghi, while Roden merrily squeezes in as many lemons as she uses aubergines. I’m not going to go quite so far: too much citrussy sourness spoils the smoky richness of the aubergine, but the dish should have a certain zing nevertheless. The great rift in matters baba ganoush seems to be over adding tahini: Seal and Ottolenghi leave it out, and Lebovitz adds a very generous 130g ladleful, which may help to explain why his silky smooth baba ganoush tastes so much like hummus. The dish is pretty good without it, but I love the way the sweet nuttiness works with the creaminess of the slow-cooked aubergine, so I’ve added just a little – not enough to overpower the other ingredients, but certainly enough to make its very Levantine presence felt. Roden also, unusually, adds Greek yoghurt to her recipe. It is lovely, but I feel it robs the dish of its lemony, garlicky punch, so I’ll be leaving it out. 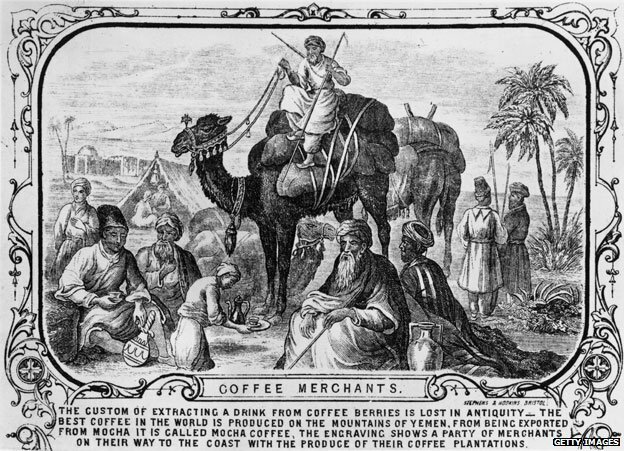 Lebovitz adds chilli powder, “and sometimes a pinch of ground cumin” to his dip; both ingredients that work well with aubergine and tahini, but neither absolutely necessary for the proper enjoyment of the dish. Ottolenghi adds 75ml olive oil to his, which makes sense as he’s not using tahini, but as I am, I prefer to do as Helou suggests and ring the dish with oil instead in the traditional fashion, so each dipped pitta gets a little of both. Helou and Ottolenghi also suggest garnishing the dish with pomegranate seeds, which look pretty if you have them, but are less vital than the chopped herbs that most people suggest as a topping. Parsley and mint are the most usual choices; Ottolenghi uses both, and Helou suggests either/or, while everyone else plumps for one or the other, except Lebovitz, who goes for parsley or coriander. I’m not sure about the latter’s soapy flavour here: the peppery sharpness of parsley seems more fitting, but best of all, in my opinion, is sweet mint, which pairs very nicely with the aubergine. Lebovitz and Seal stir some of the herbs into the dish itself, which I like – it guarantees a burst of freshness in every mouthful, and stops the greedy stealing the garnish. After all, this is a dish that’s all about sharing. Slit the aubergines lengthways and scoop out the flesh in long strands, discarding the skins. Put in a sieve and leave to drain for 30 minutes, or squeeze out if you’re in a hurry. Season. 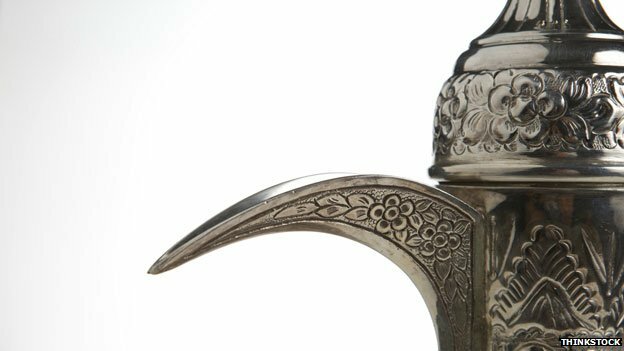 At the moment here in Brazil there is a novela (soap opera) that I enjoy, Salve Jorge, quite a bit takes place in Turkey in both Istanbul and Cappadocia; where the sophisticated Brazilians and Turks are often found sipping raki. 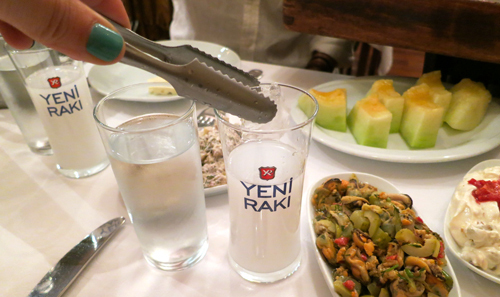 Raki is considered the national drink of Turkey. 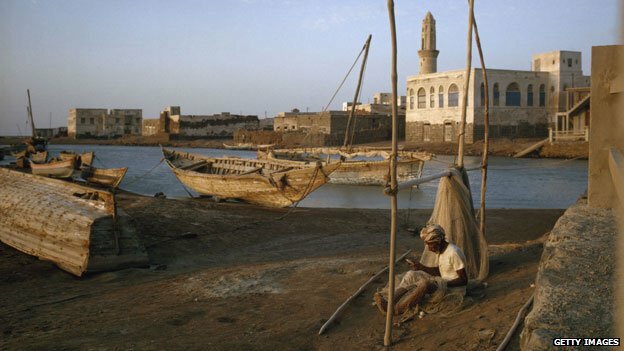 Traditionally consumed either straight with chilled water on the side or partly mixed with chilled water. Ice cubes are sometimes added. Dilution with water causes raki to turn a milky-white color like ouzo. 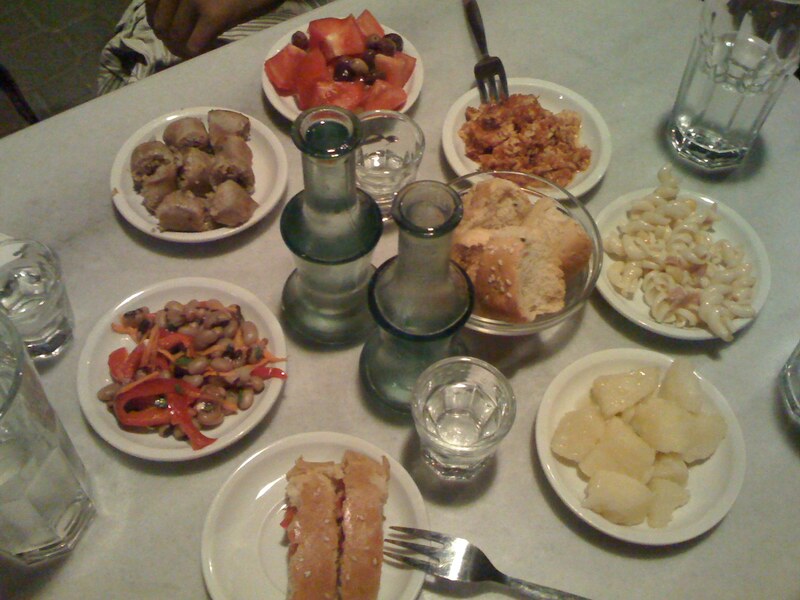 Mezze, with or without drinks, is a selection of small snacks, hot or cold, spicy or savory; they maybe as simple as cubes of white cheese or more sophisticated like walnuts and hot pepper sauce, or meatballs.